After we were appointed as the first Cooperative Baptist Fellowship field personnel in Japan, we kept hearing his name and how we should get together with him. We called and made arrangements with him, deciding to visit together for a worship service at his home church, First Baptist Church of Decatur, Georgia, followed by lunch at a Japanese restaurant. The day finally arrived and he met us joyfully, excitedly motioning for Pastor Julie Pennington-Russell to join our conversation to share with pride about our future ministry in his beloved Japan. He handed us a few copies of theological books he had written over the years about Japan and included one more, which he wrote to process the death of his wife–also a former missionary whom he had met there. As the organ began to play for worship to begin, he pulled out his Bible to read along with the scripture reader. It, however, was in the language of the country where he seemed most at home, Japan. Two weeks ago, Laura and I received the news that Dr. Charles Whaley, a Baptist missionary of 43 years to Japan and one of the very first after World War II, passed away at his home in Georgia. Though I knew he was 92 years-old, I never would have believed it with his schedule. He ran 2 miles a day and never missed a Sunday at church, over an hour’s drive from the missionary retirement community he lived in outside of Atlanta. He even published his last book, “Prophetic, Post-apostolic & Postmodern: An Oriental Approach to Three Bible Studies,” just two years ago. I first encountered Dr. Whaley during my first year at McAfee School of Theology at a scholarship luncheon. As a scholarship donor, he was there to meet students and celebrate the work of the school. He was interested in the fact that I had served with CBF’s Student.Go in China and shared both about his deep love for Japan and hope for more Japanese students to attend McAfee. I got to know him a bit more in my time on the worship team at FBC Decatur. It wasn’t until after our appointment though that we really struck up a friendship with Dr. Whaley. After that moment, he became our biggest cheerleader and wrote us several letters before and after our departure for Kanazawa. He had been praying for years for CBF to place field personnel in Japan, and after we moved here would read our newsletters and share with all who would listen about what God is doing in Japan through the Japan Baptist Convention and through us. Through his long tenure as a missionary in Japan, Dr. Whaley became more Japanese than American. Until his death, he would sleep on a futon on the floor each evening and ate sushi from the grocery store every day for lunch. The Japanese people were always on his thoughts and in his prayers. Japan was not just the place where he did God’s work, but where he lived out decades of his marriage, raised a family, and served Christ. From local church leadership to the role of chancellor at Seinan Gakuin University in Fukuoka, Dr. Whaley lived a life devoted to theological thinking and faith development. He served in pastoral and teaching roles in both countries he called home. This is even true beyond death as, instead of flowers, his family has asked for gifts to be made to McAfee–gifts that will further assist theological education and have kingdom impact for years to come. Last week, we were able to visit churches across Japan, as well as Seinan Gakuin, where I spoke with pastors and school leaders about Dr. Whaley. Everyone mourned with me, yet spoke of the great impact he had on Japanese Christianity. 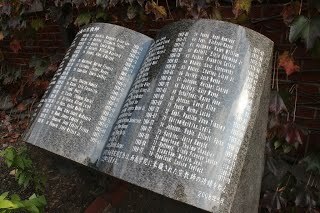 Outside the former main building and chapel on campus at Seinan Gakuin, now a school museum, there is a list of former missionaries who have been foundational in the school’s history. 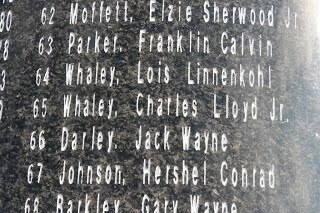 Dr. Whaley’s name is listed alongside others, including his wife’s, who have shared the message of Christ in this country. I stood there, reflecting on his role, as well as the many others that have joined with the Japanese people in spreading the faith across this country–a country where the Gospel has gained little traction over the centuries, yet where there is so much potential. I said a prayer of thanks for each of those that have come before and those that we work alongside today. The world lost an amazing man of faith this month, but Heaven gained another saint. I am so thankful to have known Dr. Charles Whaley and pray that Laura and I will faithfully carry on the ministry he laid the road for in in the days ahead. Carson and Laura Foushee are CBF field personnel serving alongside Kanazawa Baptist Church in Kanazawa, Japan.